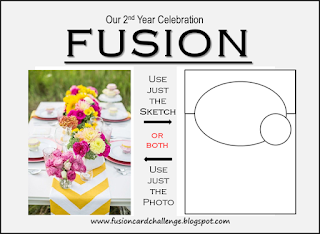 Create With Me: Fusion Challenge - January 7, 2016 - 2nd Year Celebration! Fusion Challenge - January 7, 2016 - 2nd Year Celebration! Welcome to the 1st Fusion of the New Year - and we are excited to be celebrating the Fusion Challenge's 2nd Year! We have a lovely party table photo to inspire you as well as a great little sketch! You know the deal - you can be inspired by one or the other - OR do a Fusion and use both! 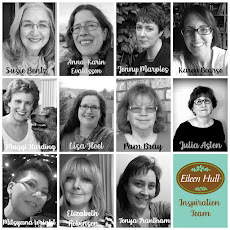 To help celebrate Fusion's 2nd year - each Design Team member has invited a friend along to be a Guest Designer this month! How fun is that?!!! I invited my friend, the very talented and creative, Loll Thompson, to be my Guest Designer - thank you SO MUCH Loll for joining us for our celebration! 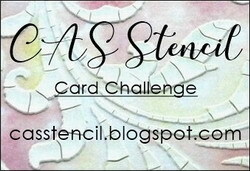 I created a FUSION card this month - being inspired by the colors, the flowers and chevron pattern from the photo - and using the sketch for my design. I really didn't have to work at the sketch - the fun dies from You've Been Framed- Oval from PTI were the perfect match don't you think??!! I also used the coordinating stamp set. I die cut the white framing and background panel out of Linen Cardstock - Fresh Snow - so there is a subtle texture to it IRL. Then I layered it to a Hibiscus Burst panel and finally to a white cardstock base. I die cut the oval part of the die from a chevron patterned paper from [email protected]/Simple Stories and adhered it inside the oval cut out. 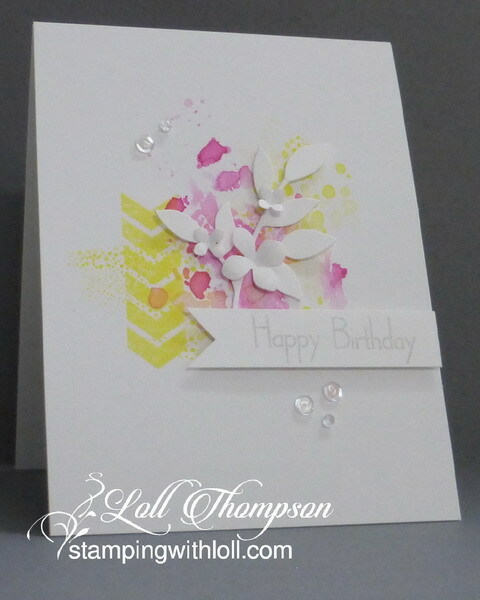 I stamped the little flower spray with Simply Chartreuse and Hibiscus Burst inks and layered it over the oval with foam dots. To finish it I simply added a rhinestone to the center of the blossom for a little bling! 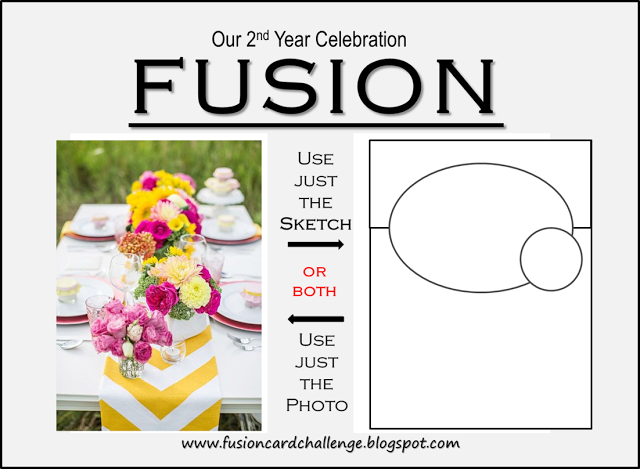 We hope you will join with us in celebrating Fusion's 2nd Year by linking up your inspired card! 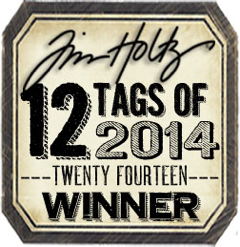 Favorites: Will be chosen by all of our teammates in two weeks! We each will choose one favourite! The winners will be announced at 4am (PST) in two weeks!! 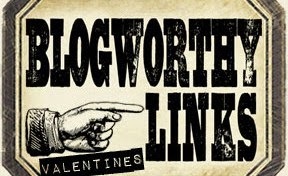 Please check the linky for the days left to play with us! 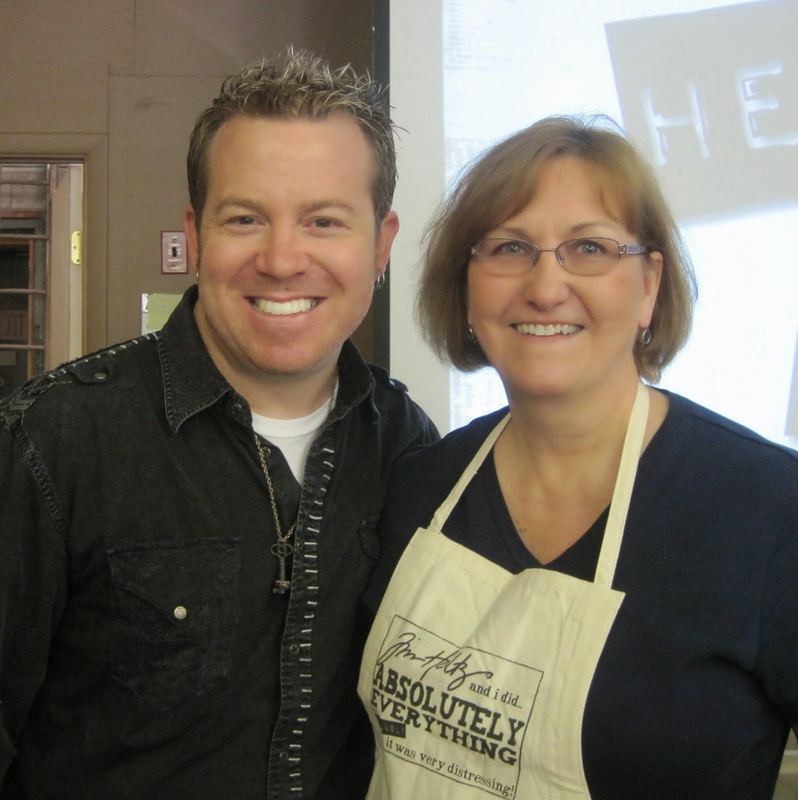 You will find all of the Design Team AND Guest Design Team creations over at the Fusion Blog! Paper: Linen Card Stock/Fresh Snow, White, Hibiscus Burst - PTI, Chevron DP - [email protected] Simple Stories. Accessories: Dies - You've Been Framed - Oval - PTI, foam dots, rhinestone- Kaiser, Scotch Quick Dry Adhesive. Love, love, love all the chevrons. Perfect design. This is beautiful, Julia, I love the crisp, white frame with the just a pop of color in the center! 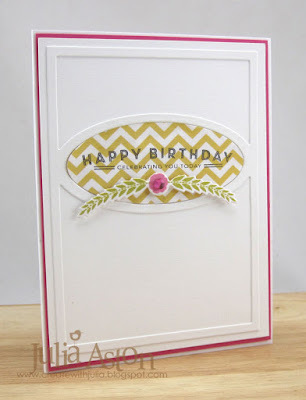 Oh, this is simply elegant with the chevron and all the white framing! Reminded me to get that set out again soon! Hi Julia. First, thank you for asking me to GD for you at Fusion. It's been fun and I'm excited to see everyone's take on the gorgeous photo and wonderful sketch. your card is gorgeous.. I love how you used that PTI die..
Wow Julia! Deleted my earlier note because I didn't realize you had both you and Loll together! Both cards are gorgeous! That die cut perfectly frames your sentiment. Its so crisp and clean and still fun with the chevrons and pop of pink! Julia I love the chevrons, so lovely for the challenge! Happy New Year! 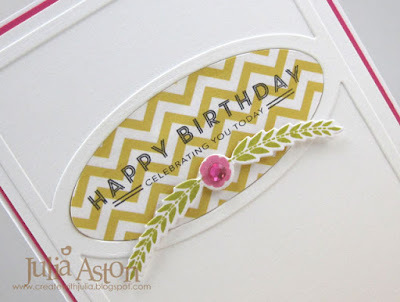 That oval die frame is gorgeous, Julia, and your card is so beautiful, clean and fresh! I just love it! Love your clean and elegant take on the anniversary Fusion challenge, Julia! So pretty Julia...lovin' both of your cards...off to Loll's blog! What a wonderful clean and elegant card! I especially love the subtle frame design. 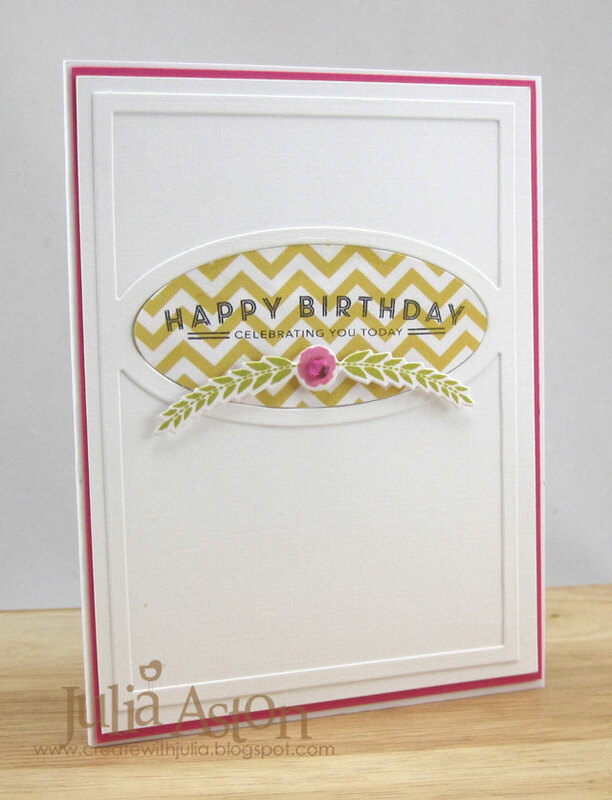 Love the framed chevron...simply gorgeous design, Julia! Beautiful card. The gem in the flower adds the perfect touch and chevrons = love!!! Well, that combination of dies and stamps is perfect for the challenge!! Your card is classically clean and simple...love it!! I love this sharp, clean look and the colours are so pretty - great Fusioning from both of you! Ohhhhh, love them both! The colors are so pretty and fabulous designs.